The summer of '19 is here! Be ready to send your child off with smiles for summer camp fun! School will soon be out and many kids will enjoy their first summer camp experience. 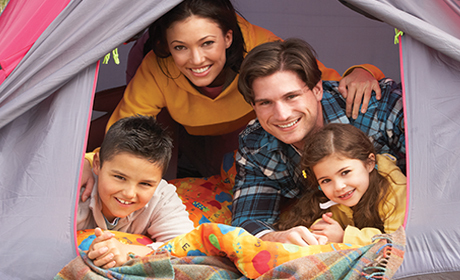 The following tips from the American Camping Association (ACA) can help your child have a successful experience, from packing to dealing with homesickness and beyond. • Headgear — scarves, bandanas, baseball caps, eyeglasses, swimming goggles, sunglasses. • Clothing — T-shirts/tank tops, shorts, long pants, a jacket, swim suit, pajamas, robe and underwear. • Footwear — boots, tennis shoes, sandals, dress shoes and socks. • Bed and Bath — towels, blanket, pillow/pillow cases, sheets, sleeping bag, laundry bag, mattress pad. • Bathroom Kit — brush and comb, shampoo, soap and container, toothbrush and holder, toothpaste, deodorant. • Other Items — Insect repellent, sun block, flashlight and batteries, books and magazines, water bottle, writing materials. Check with the camp about its policies about electronics, musical instruments and other special gear. • Encourage your child's independence throughout the year. Practice separations, like a sleepover at a friend's house, can simulate the camp environment. • Involve your child in the process of choosing a camp. The more the child owns the decision, the more comfortable he will be. • Discuss what camp will be like before your child leaves. Consider role-playing anticipated situations. • Agree ahead of time on calling each other. If the camp has a no-phone-calls policy, honor it. • Send a note or care package ahead of time to arrive the first day of camp. • Don't bribe. Linking a successful stay at a camp to a material sends the wrong message. The reward should be your child's new found confidence/independence. • Pack a personal item from home like a stuffed animal. • If a "rescue call" comes from your child, offer calm reassurance and put the time frame into prospective. Resist the temptation to bring him home early, and don't feel guilty about encouraging your child to stay at camp. • Trust your instincts. While most incidents of homesickness pass in a day or two, research shows that approximately 7 percent of cases are severe. If your child is not eating or sleeping because of anxiety or depression, it is time to go home. However, don't make your child feel like a failure if he comes home early. Stay positivve and encourage him to try camp again the following year. STILL LOOKING FOR A CAMP? 1) Is the camp accredited by the ACA? (Accreditation means the camp lives up to criteria set by an independent association of camping professionals. Camps are evaluated on the physical site, health care, programs, personnel, administration and more). 2) What is the camp's philosophy and program emphasis? 3) What training do counselors receive? 4) What is the counselor-to-camp ratio? 5) What are the ages of the counselors? 6) What are desired qualities in camp staff? 7) How are behavioral and disciplinary problems handled? 8) How does the camp handle special needs? 9) How does the camp handle homesickness and other adjustment issues? FIND LOCAL DAY CAMPS AND RESIDENTIAL AWAY CAMPS IN OUR DIRECTORIES.